Sadly, I don’t have any original content with which to dazzle your investment senses with for this post. I just want to share some noteworthy work on cycles. 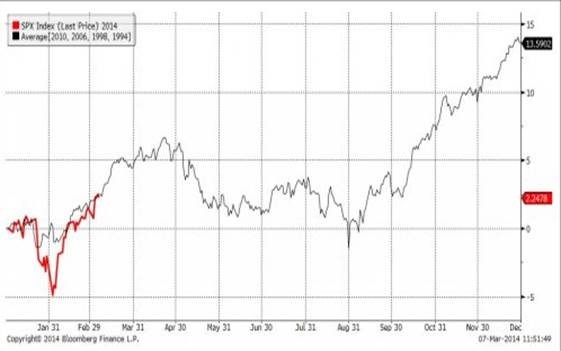 I was reviewing a couple of interesting charts this weekend, posted by Greg Schnell – The Canadian Technician. The two charts depict some consistent highs and lows across multi-week cycles. Chart number 1 breaks down the last 15 years of the S&P 500 within 66 week increments. 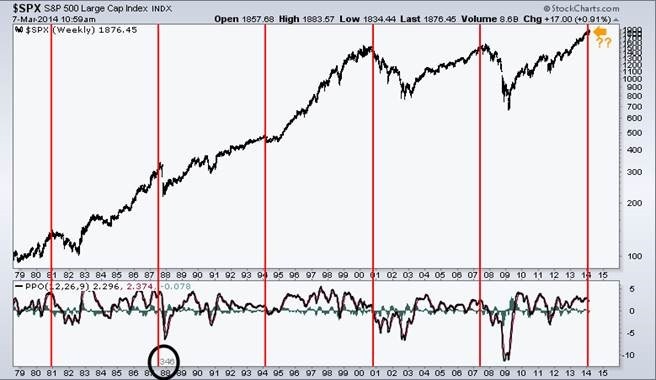 What has made the recent market cycles (last 15 years) so interesting, has been the difference in time spans. 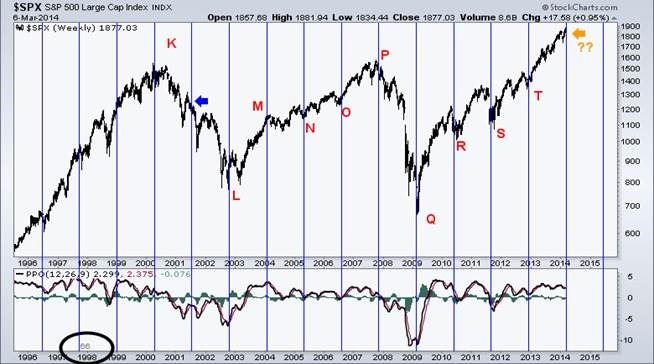 From the 2000 high to the 2002 low was a period of two 66 week time spans. From the 2007 top to the 2009 lows was 1 time span of roughly 66 weeks. Why 66 weeks? Well, it is only through the manipulation and experimentation of the cycle tool in Stockcharts that I was able to find a time span that worked for all the market turns. While multiples of 66 weeks like 132,198 and 264 work well, they all missed one of the turns. It was only the lowest common denominator that worked. This is trial and error, best fitting with the historical models. You can see it worked pretty well on most cycle lines. It missed in 2001 at the blue arrow. What is most important, is the right edge of the chart. It is telling us that we are near one of those potential reversal points that George Lindsay talked about. Only the history books will tell us how it works out, but it is worth noting in a timely manner. Upon publishing that chart, Schnell received a chart from a reader of his blog. 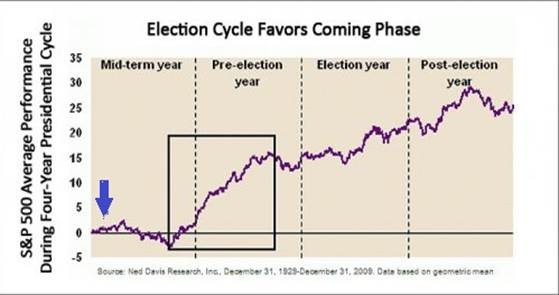 This chart goes back even farther and utilizes a 346 week cycle, as denoted by the orange lines. Chart number 2 was sent into The Canadian Technician by Richard Rhodes of Rhodes Capital Management. The chart is equally compelling due to the uncanny ability to mark major highs. Keep in mind, as Schnell admitted, these charts are “best-fitted” so to speak. So like every other chart you may look at to gauge potential direction, you have to take the information with a large grain of salt. Can’t post on cycles without touching on The Election Cycle. Chris Puplava, at FinancialSense, shared a couple of interesting charts. The first one he posted, courtesy of Ned Davis Research, is based on the geometric mean from 1929 through 2009. We’re roughly at the blue arrow in the mid-term year. Why would I share two charts that seem to conflict with each other? Because I want to continue to communicate that one must be very careful how they interpret the squiggles. It’s doubtful we’re at a major top, but those first two charts make you stop and think for just a moment. On the other hand, the Election Cycle is real, well known, and has been expounded on by countless hordes of technicians. If a gun were put to my head to decide how to invest going forward just based on these sets of charts, I would definitely follow the Election Cycle. The ongoing point across a great deal of my posts is that these are not normal times to be speculating. Thus, an extra measure of care has to be taken before running off and allocating capital based off of some macro-themed charts. For readers who don’t think that these are unique times to be an investor, then have a read of some excerpts from Seth Klarman’s latest letter to Baupost Group investors. It comes courtesy of ZeroHedge, and in it, Klarman shares his own thoughts that probably mirror many of your own regarding this Twilight Zone environment. I’ve shared Seth’s credentials a million times already but if this is your first time here and you are unfamiliar with Mr. Klarman, then he’s the founder of the Baupost Group hedge fund. He manages approximately $22 billion. He’s a notorious value investor whose skills are in a class with the best. Last year alone, he returned $4 billion to investors because he didn’t find enough compelling investment opportunities and the fund’s size may have been getting a touch unwieldy. He’s a legend, so the commentary shared in his letters is worth heeding. The volatility that has returned to the markets this year has been a thing of beauty. I know the traders of the world have enjoyed it. Well keep calm and carry on the fight to enhance your own personal wealth effect.